Ralph Marston is a self-improvement whirlwind. He is the author and publisher of The Daily Motivator website, which is described as “one of the most popular and enduring destinations for daily positivity.” Marston’s also written three books: The Daily Motivator to Go (1997), Living the Wonder of It All (2009); and The Power of Ten Billion Dreams (2011). Since I was a child, my favorite baseball team has been the Mets. And 29 years ago this week, the Mets and Red Sox played one of the most exciting and memorable world championship series in the long history of the game. The Red Sox took the first two games, and the Mets rebounded to take Games Three and Four. Then Boston won the fifth game. With a 3-2 lead in a seven-game series, Boston only needed a victory in one more contest to give the Red Sox their first World Series title since 1918. If they won, they could also finally free themselves of “The Curse of the Bambino”–the result of Boston selling Babe Ruth to the Yankees in 1919. So here we are in pivotal Game Six–which goes to extra innings. The score is tied 3-3. In the top of the tenth, Boston takes command, and seemingly guarantees its triumph by scoring two runs. And then, in the bottom half of the inning, the Mets’ first two batters are easy outs. Next up is catcher Gary Carter, who lines a single to left. Outfielder Kevin Mitchell pinch-hits and powers the ball into center for another hit. Third baseman Ray Knight gets the Mets’ third consecutive single, and Carter scores. Now the Mets are down by just one. Outfielder Mookie Wilson fouls off a number of pitches from Boston reliever Bob Stanley until he uncorks a wild pitch, with Mitchell coming home to tie the game! Amazin’! The count’s now 3 and 2 and Mookie nuzzles a Little-League dribbler to first. Bill Buckner, a Major Leaguer for more than 20 years, reaches down for the ball on his bad knees and miraculously, the ball dribbles through. Knight scores the winning run and the Mets have won a game for the ages. The seventh and deciding game was almost anti-climactic. Boston jumped on top with three in the second, which the Mets matched in the bottom of the sixth. The Mets then broke loose for three more in the the seventh–and two more in the eighth–taking the game 8-5, as well as the 1986 World Series trophy. The historic win followed one of the best National League Championship Series ever in which both the Mets and the Houston Astros played magnificently. Four of the six NLCS games were decided by one run, and three went to extra innings before the Mets triumphed. The Mets are now back in the Series and lost the opening two games to the Kansas City Royals. Could they just be setting up a replay of the 1986 miracle? Let’s Go Mets ! Star Trek’s Data was an android for the ages: brilliant and courageous, curious and compassionate. Jill Schlesinger, in contrast, is an insipid and uninspiring droid who occasionally delivers economic analysis on the CBS Weekend Evening News with all the credibility of a demented cheerleader. On Sunday, October 25, the question posed by CBS Sunday-evening anchor Jeff Glor was what’s going on with healthcare costs–why are they skyrocketing? Schlesinger then spewed forth a chirpy litany of cost increases as if she were describing her shopping list. There’s a ton of data about the higher rates. Forbes noted that from 2000-2011, health care costs rose 91%, with much of this increase being passed on to consumers. The Los Angeles Times pointed out that “annual increases in work-based health plan premiums rose three times faster than wages from 2003 to 2013.” But that’s not the whole story. “Since 2010, the Henry J. Kaiser Family Foundation commented, “both the share of workers with deductibles and the size of those deductibles have increased sharply. These two trends together result in a 67% increase in deductibles since 2010, much faster than the rise in single premiums (24%) and about seven times the rise in workers’ wages (10%) and general inflation (9%).” And we’re still not done. Annual co-pays can amount to thousands of dollars of out-of-pocket charges each year. The bottom line is that from 2002-2012, the cost of family health insurance has almost doubled, from $8,003 to $15,745. Simultaneously, median household income has decreased by 12.3%–from $68,941 (2000) to $60,462 (2014). One reason for this contraction is that wages have not kept up with increased expenses. In 2014, the Pew Research Center stated: “For most U.S. workers, real wages–that is, after inflation is taken into account–have been flat or even falling for decades, regardless of whether the economy has been adding or subtracting jobs.” Android Schlesinger didn’t explain any of this, nor did she mention an Organization for Economic Cooperation and Development (OECD) study, that asserted that , “The U.S. leads all other industrialized nations in the share of national health care expenditures devoted to insurance administration.” Health insurance CEOs, like most corporate leaders, earn an obscene amount of yearly compensation. Mark T. Bertolini, Aetna’s Chief Executive, received 2014 compensation of $15,043,936. It’s clear that android Schlesinger doesn’t want to rock the boat. A graduate of Brown University, an Ivy League school, she began her career as an options trader. She then went on to co-own and serve as chief investment officer for an investment advisory firm. For her, deregulated capitalism is as good as it gets. Why would she convey that the U.S. spends 17.7% of its Gross Domestic Product on health care while the OECD per capita average is 9.3%. And that the Prime Directive for free-market capitalism is ever-larger corporate profits, and not improved health care. During her presentation this uncritical droid was positively jaunty. On Star Trek: The Next Gerneration, Data hardly ever smiled. Marvin Koner (1921-1983) was an extraordinarily skillful and talented photographer who never sought celebrity through his work; just his next assignment. His first experience with a camera came during World War II while serving in the Army’s Photo Intelligence Unit. He trained with the legendary Alexey Brodovitch, a graphic designer and Harper’s Bazaar’s art director for 25 years. Koner was admired as both a photojournalist and as a commercial photographer. His eye was omnivorous and he produced unforgettable images celebrating the common man–as in his 1963 series, “Dublin: Then and Now” and a photo essay documenting “An Italian Family’s Migration to America.” He also photography royalty: of the musical kind (Leonard Bernstein, Miles Davis, Johnny Cash); the political (President Dwight D. Eisenhower, Martin Luther King, Jr., Eleanor Roosevelt); and Hollywood (Paul Newman). His work displays such unique insight that his photos are in the permanent collections of the Metropolitan Museum of Art, the Museum of Modern Art, and the International Center for Photography. Last month, Pam Koner, Marvin’s daughter, created the Marvin Koner Archive, a site where everyone is able to appreciate her father’s photographic art. His images will be available for sale, and the income will help fund Family-to-Family, a non-profit hunger and poverty-relief organization founded and directed by Ms. Koner. The group’s agenda is profoundly simple: link families that have done well with families that need help. The genesis of F-t-F was one indelible newspaper image and article from 2002 that described a poverty-stricken, hungry familty living in Third World conditions about one hour outside of Chicago. For the food deprived, frequently, by the last week of the month, the pantry is empty. Feeling the need to do something about so many men, women, and children going hungry, Pam began asking families with whom she had connections whether they would be interested in going to the supermarket and buying food basics to assist poor families. Many said “Yes,” and Family-to-Family was born. Today, it’s active in 12 states and each month provides more than 12,000 meals to 1,800 families.The need has been so great that F-t-F is now a national organization that also immerses itself in disaster relief and literacy projects. But the core idea is still one family packing a carton that will be opened by another family that desperately needs what’s inside. Often, snapshots and notes are included fostering loving communication between neighbors who might live hundreds of miles away. As the Christian Science Monitor put it, “How can you describe someone who has changed the lives of thousands of people from the basement of her home?” The Archive/F-t-F connection is definitely a win-win deal. Amaze yourself with Marvin’s photos, and then, if the spirit moves you, consider purchasing one. Besides obtaining an image to treasure for a lifetime, you’ll also be helping Pam to continue her struggle against American poverty. Maybe it’s the Cadillacs buried headfirst in the ground outside of Armadillo. Maybe it’s “Keep Austin Weird,” the unofficial slogan for Texas’ state capitol. Maybe it’s that Texas has executed nearly five times as many prisoners as any other state for decades. But whatever the reason, in Norway, when someone refers to something as “crazy” he or she says it’s “texas.” According to the BBC, a very common expression in Norwegian newspapers is “helt texas,” or “completely crazy.” Who would have thought that the bucolic Norwegians were such snarky little devils? Of course, any state that houses a library and museum dedicated to George W. Bush, one of the worst presidents ever, must be completely crazy. 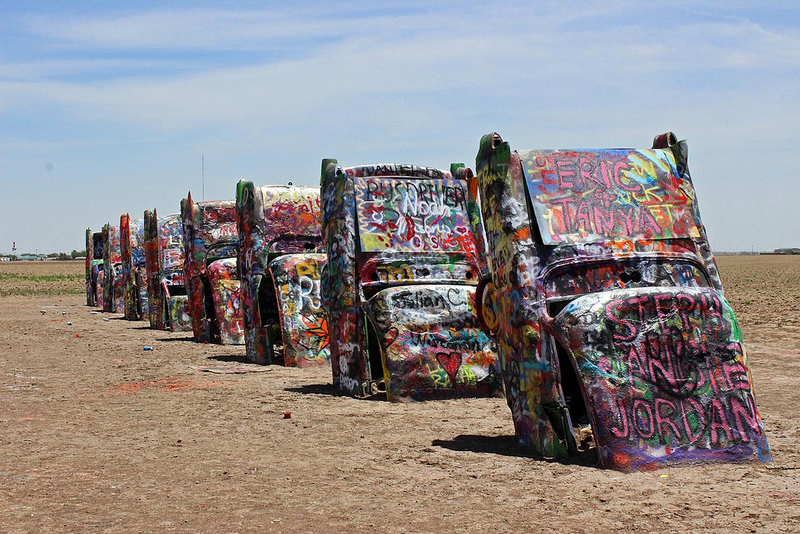 A view of Cadillac Ranch, near Amarillo, Texas. 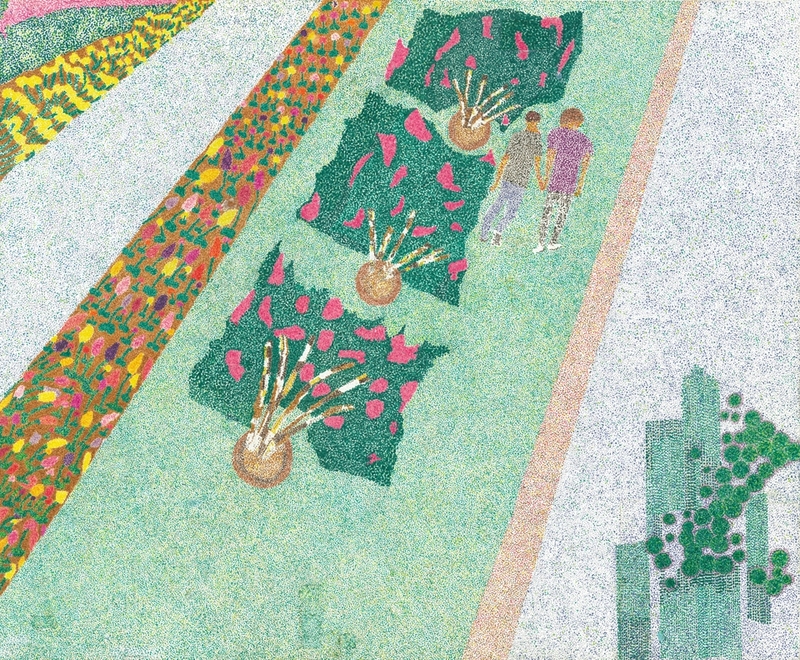 This is the first work in which I used the technique of pointillism. It won first place in a group exhibition. A Walk in Paradise and more than 20 more of my artworks are available as prints at Etsy.com.